Malnutrition and hunger are words that pair well together. Long term hunger and a lack of nutrients leads to malnutrition. Those who are chronically malnourished lack nutrients for better health, they are more likely to fall ill and in more severe cases, might even die. Majority of the world’s population who experience chronic hunger and malnutrition suffer from significant health problems. A malnourished child’s growth is often stunted. The most common nutritional deficiency amongst those malnourished is iron deficiency that leads to anemia. If a pregnant women is malnourished, the child has a lower chance of survival. The vitamin A deficiency from malnutrition is the main cause of preventable blindness in the developing world and kids with a severe deficiency of this vitamin have a greater chance of dying from infections such as diarrhoea or measles. The iodine deficiency causes mental retardation and delayed development in kids. Whilst an iron deficiency in infants delays development. Fortunately, Heifer International South Africa (Heifer) has helped families in impoverished rural communities for more than 15 years, to reverse the harmful effects of malnutrition by empowering those in need to turn hunger and poverty into better health using sustainable agricultural methods. The projects that help empower these disadvantaged people have helped provide children with better nutrition. The flourishing spinach gardens in most projects have provided an adequate amount of iron. The lack of iron is responsible for the most common form of malnutrition worldwide. The spinach gardens help the community consume foods high in iodine and this can help treat and prevent future iodine deficiencies. With the help of Heifer’s trainings, the root issue of malnutrition can be addressed. Essentially improving the community’s diet towards better health. These green leafy vegetables are amongst the world’s healthiest vegetables and have a top ranking for nutrient richness. 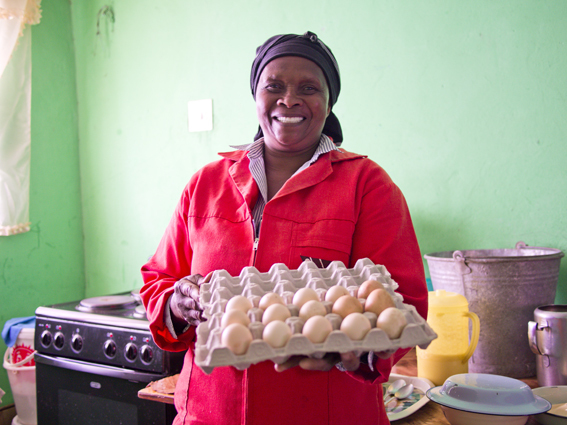 Heifer’s poultry projects have helped provide better nutrition to the communities with eggs. The chickens provide eggs and eggs contain one of the highest-quality proteins of any food. The protein found in eggs provides energy and nutrition for healthy bodies. Eggs contain every vitamin except vitamin C. Eggs are also high in vitamin A, which helps combat blindness caused by malnutrition. They are also a good source of iron. Eggs are an important vehicle to provide the undernourished an essential vitamin supply. The President of Poultry Association of Nigeria (PAN) had referred to an egg as “Gods natural pill that can conquer hunger, food insecurity and malnutrition,” and noted that “it contains the best proteins, vitamins and minerals.” In India, awareness programmes such as ‘World Egg Day’ are held on the second Friday of October and are used to raise awareness of eggs as a means to fight malnutrition.